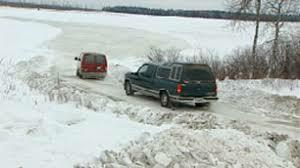 Twenty-two Manitoba Communities Now Have Access to Winter Roads. Manitoba Infrastructure Minister Ron Schuler has announced all northern communities now have access to the winter road system allowing for the delivery of supplies. In our area the 138 kilometer winter road from Pukatawagan to Highway Ten is reported to be in good condition. Schuler says winter roads not only facilitate the hauling of freight to northern and remote communities but also provide the residents with temporary inter-community travel as well as road access to the rest of the province. He adds the government will spend 4.5 million dollars providing 22 northern Manitoba communities access to the 24 hundred kilometer network. In a typical season more that 25 hundred shipments are delivered to a large number of isolated northern communities from mid-January to mid-March.